University of California, Davis engineering students Sam Dawson (left) and Andrew Chung (right) demonstrate their engineering project at the Bay Area Maker Faire. The microprocessors in each box are equipped with infrared sensors and emitters that “talk” to each other and glow different colors to indicate their relationships to another box. The project provided hands-on experience in both hardware and software to supplement lectures and textbook learning. Watch the video on YouTube Channel KH6WZ. 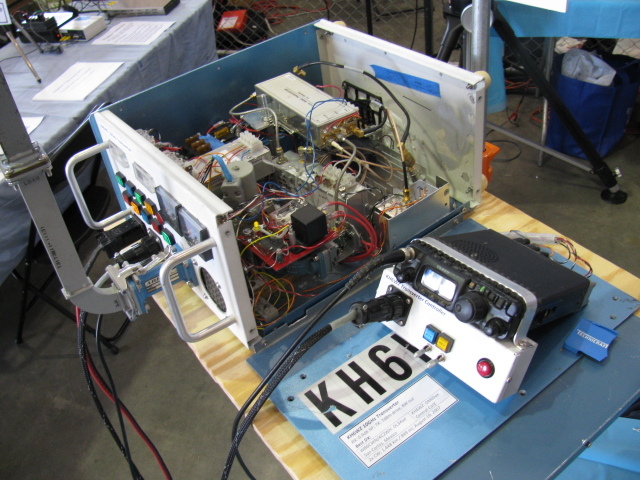 This is our third consecutive appearance at the Bay Area MF, and continues my theme of showing how some ham radio operators continue the tradition of “teaching, mentoring, making, modifying, repairing and improving” radio and radio-related technology. Read my post about ham radio and the Maker movement. Today’s ham radio operators have an incredible amount of exotic surplus material that can be converted into everyday use on the ham radio bands. Grandpa certainly never heard of surface-mount technology, talking on homemade 47 GHz transmitter-receiver systems or pocket-sized, satellite navigation systems (GPS). But he sure did mentor, make, modify, repair and improve the equipment in his bedroom radio station…..
More information on the Maker Faire Bay area. Here is a gallery of our booth posters for the 2014 Bay Area Maker Faire. More photos, videos and stories will follow. . . . . The big show is coming soon. Last year, over 120,000 people attended this science-art-food-engineering-fun-educational event. A group of University of California, Davis (UCD) engineering students will join us to demonstrate their experiments and projects. These new engineers are getting a great head-start by doing hands-on, practical experiments and projects that go beyond their lecture and textbook learning. Read my LinkedIn post to understand my personal passion about amateur radio, Makers, the Maker Faire and education.